Want to stream music or videos for free right within your browser without having to open multiple tabs? In comes Solayo, a Web app that aggregates content from YouTube, Dailymotion and SoundCloud, letting you search for and play music and videos from just a single site. Solayo is extremely easy to use. Just head to the site, key in a search term if you have in mind what you’re looking for, and the results load accordingly. The results can also be filtered by content providers if you only want to zoom in on either videos or music. If you don’t feel like searching, you can pull up Solayo’s ‘Radio’ tab to choose from radio channels that are organized by music genres. The music and video player is located to the right — this is where you play and manage your music and video collections. Just hover over each song that is listed to get options to play now, play next or add to your playlist. In a blog post welcoming users to Solayo, the team says that it set out to provide an “all purpose” media player so people can not only search for music and videos from a variety of content providers, but also consume them seamlessly. On Solayo users will be able to ‘search and consume on the go’; what this entails is a platform where users can search for content, play the content and whilst it’s playing, the capability for searching for more content to consume without any interruption to one currently playing is available. Basically, Solayo provides a pretty brilliant and convenient service for those who consume music or videos from multiple providers. In other words, unlike Spotify, Pandora, Rdio or other music streaming sites already popular with many people, Solayo does not provide digital content from record labels — instead it rounds up music and videos that are publicly available, and gathers them in one place. However, just like Spotify and other music streaming services, Solayo has a social aspect to it. You can easily share your favorite songs or playlists on Facebook or Twitter — just sign up for an account, add the song into your playlist and the option becomes available. 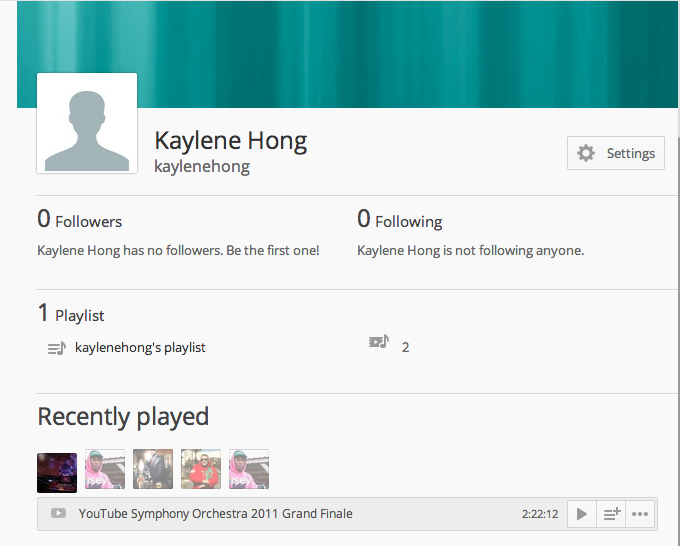 You can also follow people to see their playlists and send messages to other users. The team behind Solayo is not content with just helping to round up and stream music and videos. In a blog post, Solayo’s founders say they want to make Solayo a “discovery platform through a multimedia and interest perspective”. Solayo wants to be a platform where individuals can connect via visual/audio content with an Interest network. While we know most people will want to use the app to collect and listen to music, we also want to make it easy for them to find contents that they may like and people who might like similar interest. Solayo is still very new — it launched in July and its page says it’s in beta version — but there is an element of uncertainty since it doesn’t actually own its content. Though it seems unlikely because the content is all public, it remains to be seen if any of the aggregated services could cut Solayo out. Despite the uncertainties, Solayo is a service worth checking out — it’s basically a free, ad-free (for now), unlimited version of Spotify — and even comes with videos. One second you can be listening to pop music, and the next you can be watching the YouTube symphony orchestra play. It’s a service that you may just grow to love.